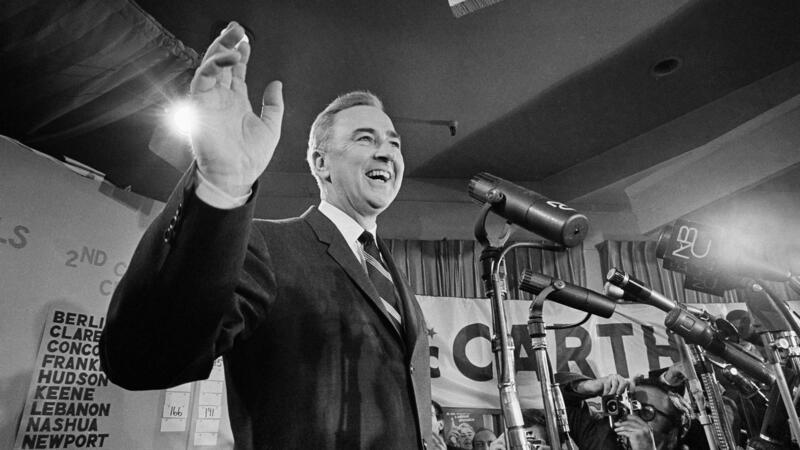 Sen. Eugene McCarthy, D-Minn., waves to supporters in his campaign headquarters, March 13, 1968, the day after the New Hampshire primary showed strong support for his opposition to the Vietnam war. There have been other dramatic outcomes in New Hampshire, both before and since, scuttling careers and altering the political landscape. But none has shaken the earth like the results of 1968. Lyndon Baines Johnson was the president, having assumed the job when President John F. Kennedy was assassinated in November of 1963. Johnson had then won a term in his own right in 1964 with one of the biggest popular-vote landslides in U.S. history. Johnson had strong-armed Congress to pass the Civil Rights Act and the Voting Rights Act, as well as the Great Society programs such as Medicare. When New Hampshire held its primary in 1968, Johnson was the prohibitive favorite to win the Democratic nomination for another term. But Johnson was also the president who had dramatically escalated the U.S. commitment to war in Vietnam, after saying he would not "send American boys to do what Asian boys should be doing." On this day, in this New England state, he would pay the price for that decision. He would end the evening with his political fate in free fall. Johnson's glide path to re-election was supposed to begin with a convincing win in New Hampshire over intraparty challenger Eugene McCarthy, a relatively obscure senator from Minnesota. But McCarthy was running as an outspoken opponent of the Vietnam War. He had other issues, but Vietnam was his trademark and his passion. He knew Johnson had inherited the conflict from Presidents Kennedy and Eisenhower, but he rejected the long-accepted wisdom that stopping communism required resisting it actively everywhere. He especially rejected the practice of propping up unpopular dictators and the supposed necessity of sending half a million troops to fight in jungles half a world away. McCarthy was not a major player in the Senate. Remote and often professorial, he seemed ill-suited to lead the tumultuous anti-war movement. He had no money and had only begun working the state in late January. One pre-primary poll in the state found him barely registering in double digits. The polls may also have missed the late surge in voter interest, spurred in part by hundreds of young volunteers who streamed into the state to campaign for McCarthy. Many of these were college students who had shaved and gotten haircuts to campaign for the Minnesotan ("Get clean for Gene"). On primary night, a jubilant McCarthy would say: "People have remarked that this campaign has brought young people back into the system, but it's the other way around. The young people have brought the country back into the system." It must also be said that Johnson never campaigned in New Hampshire that year, nor had he even officially declared himself a candidate for re-election. His name did not appear on the printed primary ballot and had to be written in, reflecting the degree to which the president's renomination was simply assumed. Still, when the votes were tallied that March night, McCarthy had more than 40 percent of the vote, holding Johnson under 50 percent. It was a plurality win, but, given the expectations of the time, it was almost as stunning as an outright loss. McCarthy won half the counties in the state and in four cities — Berlin, Concord, Portsmouth and Rochester. Within days, McCarthy's anti-war crusade had attracted a new, rival champion — Sen. Robert F. Kennedy of New York, brother of the slain president. RFK, as he was known, had served as attorney general for a time under Johnson but the two had never been close. Each saw himself as the heir to JFK's legacy and the other as unworthy of it. When he jumped into the primary chase, RFK seemed very much to be piggy-backing on McCarthy's breakthrough in New Hampshire. Some of the latter's more idealistic backers never forgave what they saw as opportunism. But by waiting for someone else to expose the incumbent's hidden weakness, Kennedy surely enhanced his own chances of snatching the nomination. And his entry into the field greatly increased the sense that the incumbent was in peril. Both Kennedy's entry and the New Hampshire vote itself were reflections of deepening dissatisfaction with the war in Vietnam. In early March, the nation was still absorbing a torrent of bad war news from the Tet Offensive beginning at the end of January. Tet was an all-out assault on the cities of South Vietnam by the army of North Vietnam and its guerrilla allies, known as the Viet Cong. No less a media personage than Walter Cronkite, the seasoned veteran of decades with CBS News, had gone personally to the battlefield in Vietnam in February and declared the war unwinnable. Reeling from these multiple blows, Johnson would decide, before the end of March, to abandon his pursuit of another term. He would tell the nation via TV broadcast that he would not seek, nor even accept, the nomination of his party for another term. Why did LBJ decide to take a knee in the heat of that season? Some would blame the Tet Offensive or the coverage of it in the media. Some would blame McCarthy or Kennedy or both. But by far the most compelling narrative explaining LBJ's retirement revolved around the humbling vote tallied in New Hampshire on March 12, 1968. LBJ's announcement on March 31 would stun the nation, but in a sense, it had been coming since the results rolled in from the last precincts in New Hampshire weeks earlier. That primary has since become the stuff of legend and myth, and students are sometimes surprised to learn that Johnson had actually won the primary in raw-vote terms. But the actual tally seemed not to matter at the time in comparison to the shattered expectations that had preceded the event. In that sense, New Hampshire was a kind of metaphor for what was going on in Vietnam. By conventional measures of territory held and numbers of the enemy killed, the U.S. was winning in Vietnam. But after three years of breathtaking escalation, heavy bombing and mounting casualties, the U.S. seemed further from victory than ever. The New Hampshire primary would turn out to be LBJ's last race, but only the beginning of a series of dramatic and often tragic events in the year of 1968. And while it began the end for LBJ, it proved a hollow victory for McCarthy. Under the nominating system in place at that time, the New Hampshire primary did not finally commit delegate votes at the Democratic National Convention. Kennedy in 1968 would win the big state events but be gunned down by an assassin after winning the California primary. The sense of New Hampshire 1968 as a great expression of anti-war protest has also been muted by history. Post-primary polling and other research indicated that some who voted for McCarthy that day were protesting other elements and aspects of the LBJ presidency. Some were even expressing frustration that the war was not being prosecuted more vigorously. That said, the effect New Hampshire had on Johnson himself was undeniable. That alone has enshrined it as a turning point in the anti-war movement and as an inspiration to student activism in that era and since.